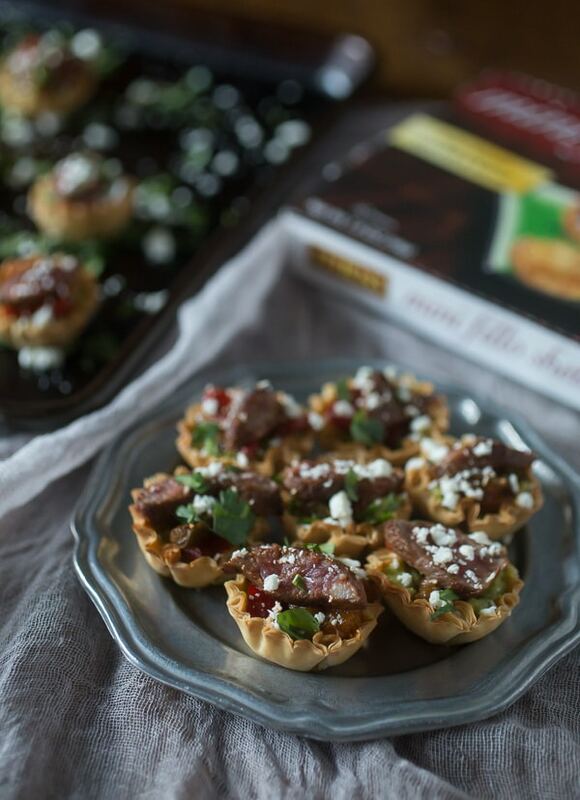 These mini steak fajita phyllo bites are the perfection combination of guacamole, peppers, steak, cheese and cilantro all in one mini phyllo cup bite. Steak fajitas are one of those dishes I almost always order out but never make. I always think about how they arrive to your table all smoking hot with a giant warmer of fresh tortillas just waiting to be filled with meat, peppers, guacamole and cheese. The one and only time I made a big batch of fajitas it was a disaster. I started the meat without thinking about how I should have prepped the vegetables first, then the meat was done and I was left trying to chop up a bunch of vegetables and grate some cheese. Finally everything was done and we were ready to eat. Well, I forgot about the warm tortillas so then I had to rush to get those warm. In the end dinner was fine but pretty much everything was cold and I figured it was in my best fajita interest to just order them when I go out. However, now that I know how to make my fajitas mini I’m totally going to rock it. 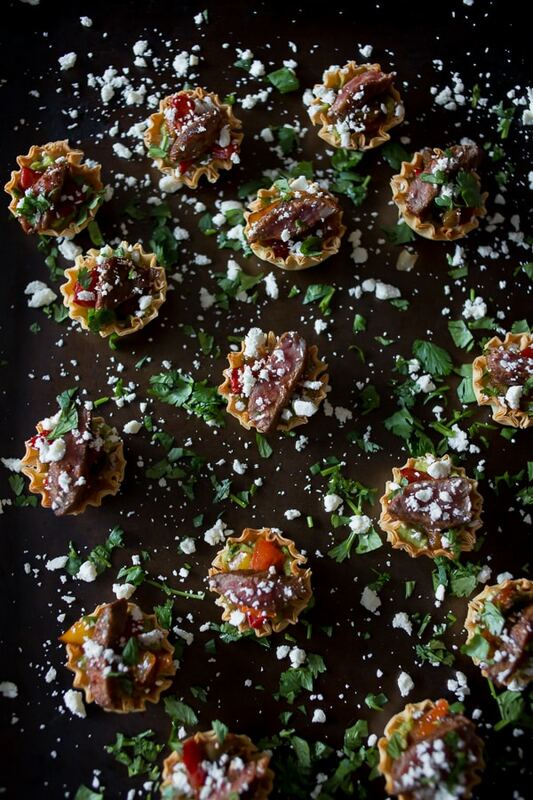 These little bites get their crunchiness from the use of Athens phyllo cup shells and are then filled with tangy guacamole, quick sautéed peppers, spicy seared steak, cotija cheese and cilantro. 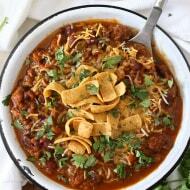 The thing I love best about these bites are that they are easy to throw together and are perfect football food. I don’t personally watch football but my husband assured me they were perfect for watching the game. Right after he said that he took the tray (yes, the whole tray), went and sat down and ate them all. So if you’re into that whole football thing this appetizer is for you. Plus you get to make cute mini food. Who doesn’t love mini food? Looking for more football appetizers? 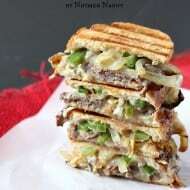 Try my Greek lamb meatballs, curried chicken salad phyllo cups or my creamy chicken taquitos. Lay out steak and cover with kosher salt, smoked paprika, cumin and chipotle chile powder. Add olive oil to a small skillet set over high heat. Once the oil is hot add in the steak and cook for about 30 seconds to 1 minute per side. You're just searing the outside because you want the inside of the steak to be slightly rare. The exact time frame of cooking will depend on how thin your steak was sliced. Remove the steak from the skillet and set aside to rest. Turn the heat down to medium and add in bell peppers. Saute until soft and then remove from the heat to let the peppers cool. Preheat oven to 350 degrees, add fillo shells to a baking sheet and cook for about 5 minutes just to brown and crisp the shells. Add about 1/2 teaspoon guacamole to the bottom of each phyllo cup. Top with a few pieces of cooked bell peppers and a slice (or two) of steak. Top each cup with a little sprinkling of cotija cheese and minced cilantro. Disclosure: This post is sponsored by Athens Foods. As always all opinions are 100% my own. Want to learn more about Athens Foods? Follow them on Facebook, Twitter or Pinterest! These are so fun! I love them! These look so delicious! Loving the flavors you’ve got going on here! These little bites sound so yummy! I’ll need the entire tray, please. Just pass it this way. These are so cute and so fun! I love those little phyllo cups! I am seriously in love with these! Not only are they small and cute, but the flavours sound out of this world! I think I could easily eat a dozen of these…yum! Oh these are awesome! I wonder how long they’d last?? NOT long at all! I would eat each and every one of those cups. These are BE.YOND! These look dangerous. They are so small and cute, I would probably eat 50 of them! YUM! These look amazing! The perfect little snack! Or in my case, dinner, because I would probably eat about 30! Oh boy, yes yes and yes!! Nom!!! Perfect little steak fajita bites! 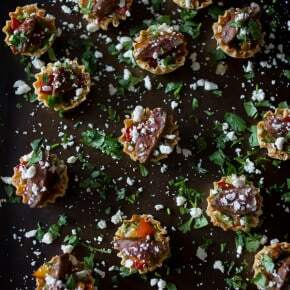 I love those little phyllo cup shells and what a great idea to make little fajita bites! I’ve made fajitas at home like once and it didn’t go well. These would be so much better! Clearly we both share a love for the Athen mini fillo shells! I could make a whole dinner out of these steak fajita bites! I love appetizers and my husband loves meat. We’d both be very happy with your steak fajita phyllo bites, that’s for sure. I love fajitas but I so get you; not hard but so many varied ingredients that it’s just easy to scoot to someplace close and let them do all that work. These bites however I do believe I could manage; they sound wonderful! 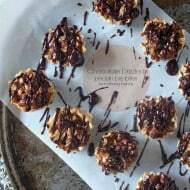 These are so cute and sound delicious, perfect for a fall party! I could eat about a dozen of these. Yum! I love little bites and tapas. Your cups are adorable and the spices are wonderful. I love practically anything with phyllo and the steak fajita sounds delicious! These are fantastic. I love them…I want them for my book club on Friday…do you deliver? Everything is better mini!! I’m doing this all the time with dinner. Not prepping or planning and then everything blows up in my face, haha. I could eat like 10 of these! This seems like a perfect party bite! I’m always looking for bite-sized recipes to add to my arsenal! Thanks! If I made these for a work function, I don’t think I’d ever have to wait for the scantron machine ever again. I just love these! Great idea to put all these delicious flavors in phyllo cups. LOL! Just as I was thinking I’d probably eat the whole batch, I read that I wasn’t the only one (phew). These look like serious appetizers – so tasty. Mini food is MY kind of food. Love these flavors in the Athens cups! 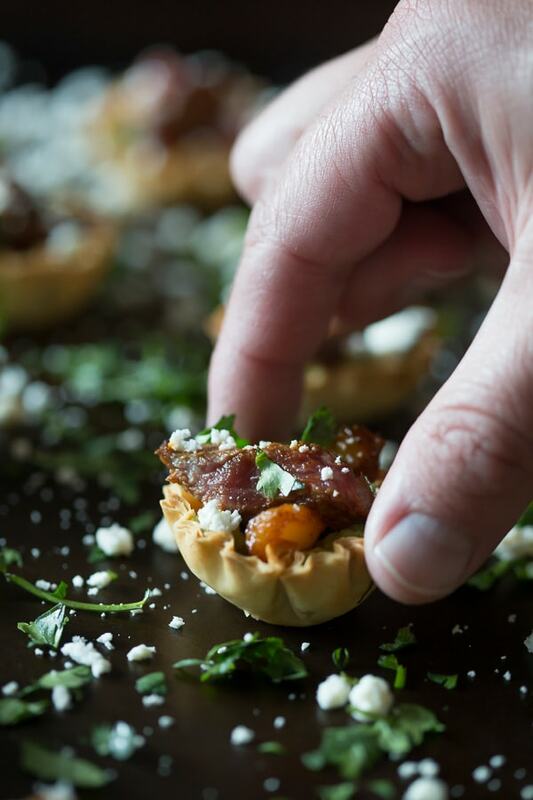 I will be forever grateful for these Athens mini phyllo cups… they are lifesavers when it comes to making a quick small bite dessert or appetizer. Love them and love your idea! These are totally going on my game day menu! Every time the girl at our local joint puts down the piping hot fajita skillet she says “don’t touch it, it’s hot”…..and every time I go “omg I’m like a 2 year old and now that you said don’t I want to do it”. Then she huffs off. Apparently she doesn’t get that I’m kidding. Like I’d touch it. Okay, so I’d totally touch it just to see, but how does she know that. Ha. I love these SO very much. It’s cute food, but also perfect for game day. And it has all my favourite things in one little bite. Your photos, as always, are so beautiful. You should teach classes. I’d totally sign up. I’m laughing at your description of making fajitas. That’s exactly why I hate making multi-component meals! These fajita bites definitely look more my style. Came back to show my husband these little bites and he can’t stop talking about them! Love this TASTY idea! Thanks!